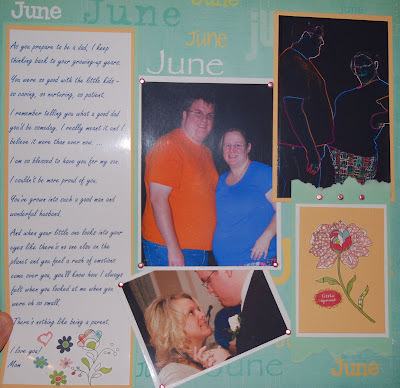 CardMonkey's Paper Jungle: Scrapbooking, too! My card making has taken a bit of a backseat while I catch up on the month-by-month pages celebrating my daughter, Emily's, pregnancy. Yesterday, we learned the little Pumpkin will be a girl, so we're heading into PINK PAGES pretty soon! And today, I marked the occasion by buying a TON -- or at least a full shopping cart -- of pink pretties at Babies 'R Us. I got sheets, blankies, receiving blankets, clothes, clothes and more clothes, booties, socks, and my favorite, a monkey who now wears pink and brown plaid high-top sneakers tied with ribbons. Here are layouts that I did to honor Emily's month of May, as well as Josh's month of June. Josh gets the month celebrating Father's Day. Josh's Mom Sherry wrote a very touching message on Josh's Facebook wall on Father's Day. It was perfect to "lift" for inclusion here, and I included a picture of Sherry and Josh from Emily & Josh's wedding day. 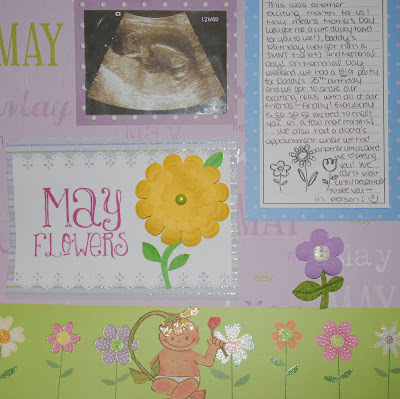 Some fun photos on these layouts include Baby Girl's ultrasound picture from week 12 day 6, and a stylized neon outline on June's page (upper right) of Josh and Emily's bellies touching. Too cute! Some techniques to mention: New I-Rocks embellishment -- looks like brads but it's really melt-on rocks -- that comes with a handy battery-op (no wires!) applicator; also, note the 6-layer yellow zinnia, cut from a Makes The Cut user gallery app file.